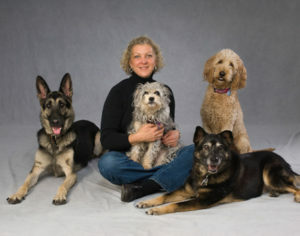 Janice has been training dogs and their people since 1997. As a certified professional dog behavior consultant (International Association of Animal Behavior Consultants) and dog trainer (Council of Certified Professional Dog Trainers) she teaches mainstream, sport, and specialty classes, workshops and lectures through Dog Behavior Solutions, Inc.
Over the years, Janice has taught classes and earned championship and other titles with her own dogs in agility, rally obedience, formal obedience and canine scent work. She received the 2012 Association of Pet Dog Trainers National Community Educator of the year award for helping to ensure that responsible dog training is available to all reaches of her community. Janice teaches classes at a variety of facilities in the Chicago area. She remains a perpetual student of behaviour and training by staying enrolled in a number of classes with her own dogs, competing with them in a variety of canine sports and by attending dog behaviour and training seminars across the country.